Another Fowey Classics has come and gone ,the 22nd ,so the traditions and camaraderie continues. Numbers were down this year but those who did attend enjoyed the event. The Forecast for the passage to Fowey on the Tuesday wasn't good ,Southerly 5/6 so many didn't venture out. In the event there was no wind but a long swell. Motors were the order of the day. That evening the Royal Fowey Yacht Club hosted a reception sponsored by Gallagher Heath followed by a Barbeque/buffet on the terrace on a lovely sunny evening. Old friendships were renewed and the 1st time attenders soon made new ones. Thanks for a great BBQ Matt (the chef at the club. People had come a long way to be at the Fowey Classics none more so than A.P.Herbert all the way from New Zealand to be aboard the boat he deigned and built in New Zealand. Slyboots owned by his nephew Buzz Heard a classic dayboat. Wednesday morning allowed time to make vessels ship shape and hoist all the flags. The weather freshened from the south and a sharp and choppy sea built up. An attempt to hold the afternoon race was abandoned with the committee ship and race team glad to get back into the harbour. There was a doubt that the evening races would take place but the wind abated and after a delay for a large ship movement the first Troy and Fowey River races as part of Classics took place. 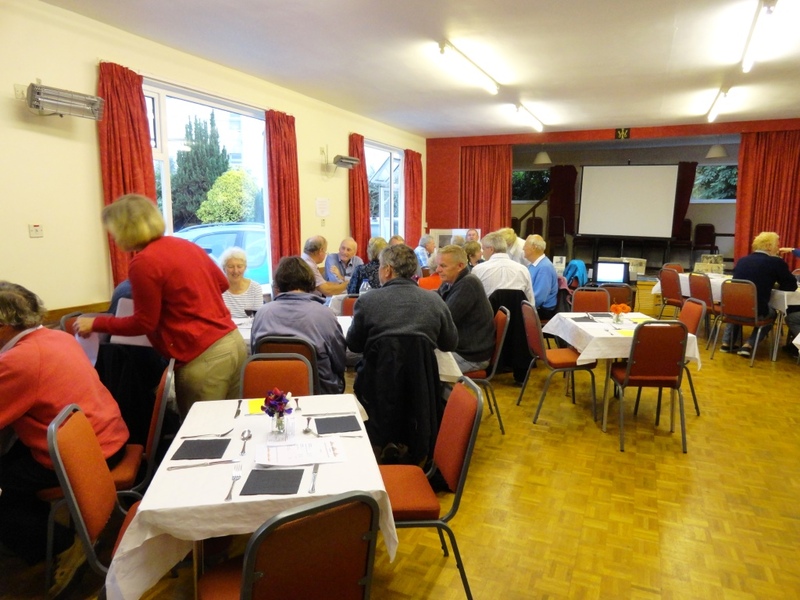 The Classics RNLI quiz held in Polruan in association with the Polruan Branch was well attended .All enjoyed the excellent food and this was followed by a talk by Rob Thompson a Trustee of the Gypsy Moth IV Trust.He also auctioned a number of artefacts boosting the funds raised. 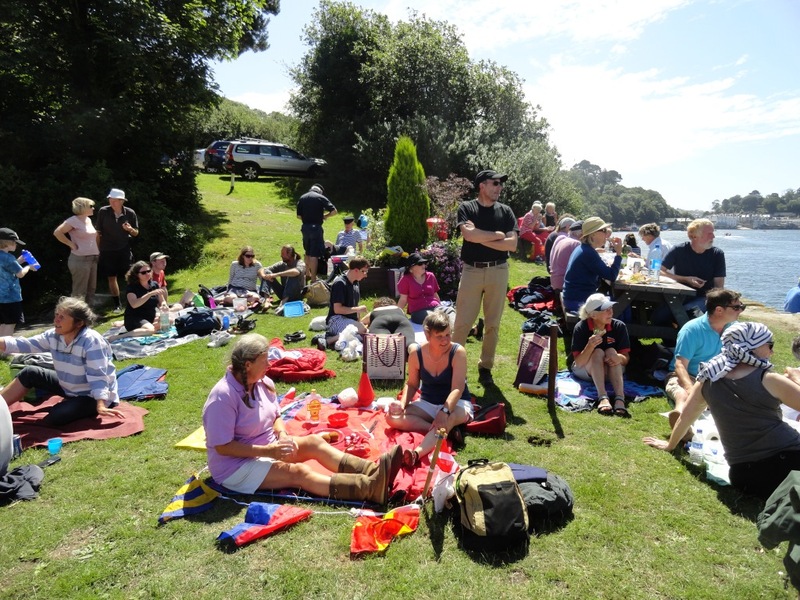 The afternoon race sponsored by Old Puteney Whisky got underway in light and variable wind which eventually freshened enough to get finishes in in time for the cream teas at the Fowey Gallants S.C. 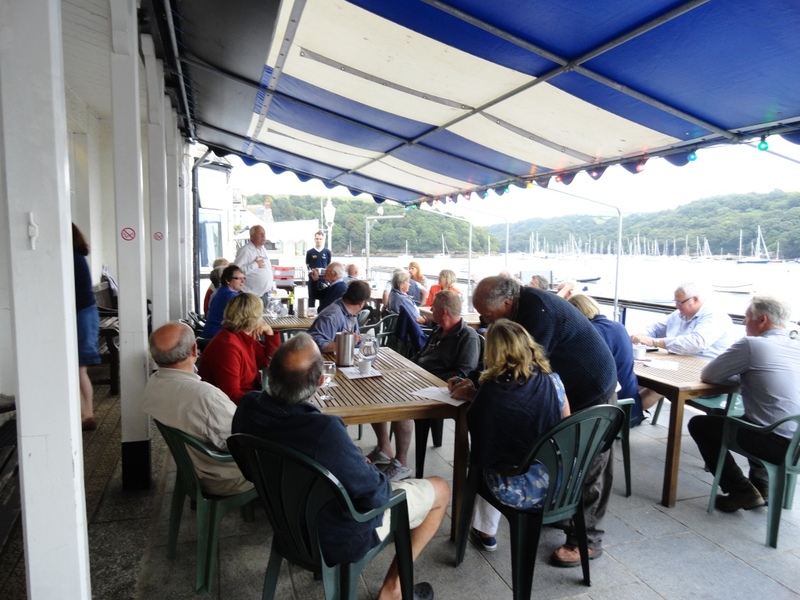 This was followed by Wine tasting at the Royal Fowey Yacht Club held on the veranda.Richard and Jake making learing about wines enjoyable. The wine tasting at the Royal Fowey Yacht Club - always a good night! At 2030 Marcus Lewis Troy Class Captain and local boat builder gave a talk about the history of the Troy class and the early handicap racing in the port. All those who attended found the detailed history that Marcus has put together and some fascinating stories of past racing events which has led the class to its present strength. A truly classic class. On Friday the wind had freshened again with a lumpy sea making it unsafe to anchor off a beach if one could be found . It was agreed that a site in the estuary would be the best and Penmarlam quay was chosen. Bathed in sunshine and with the tide in it was a excellent venue for the traditional event. Many hadn't been to the facilities here with showers and toilets and the friendly log cabin café where Trevor, Allen and Kevin look after everyone. There's a landing pontoon with the south side for visitors making it easy to access and a picnic without getting the feet wet. 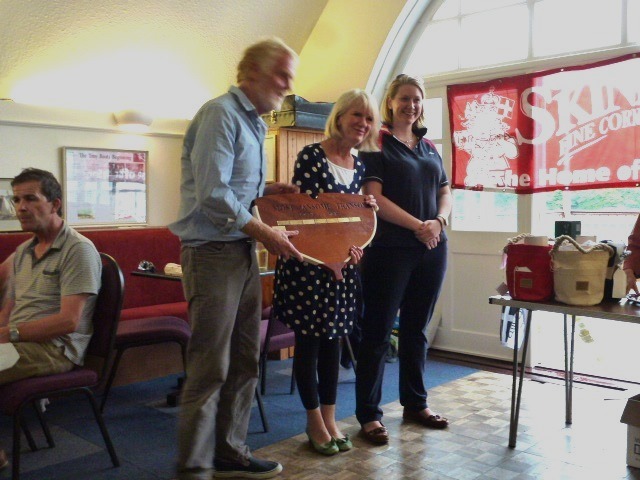 The Zircon;s Crew won the Kittows of Fowey £30 voucher and ladies on Tiger were a close 2nd winning a £20 voucher. Thanks Richard for your generous support of the Classics. There was no afternoon pursuit race but some craft went sailing enjoying the backdrop of the Cruise liner Silver Wind. A massive thunderstorm with deafening bangs and massive lightening flashes made the Gallants yard to wet for the prize giving. 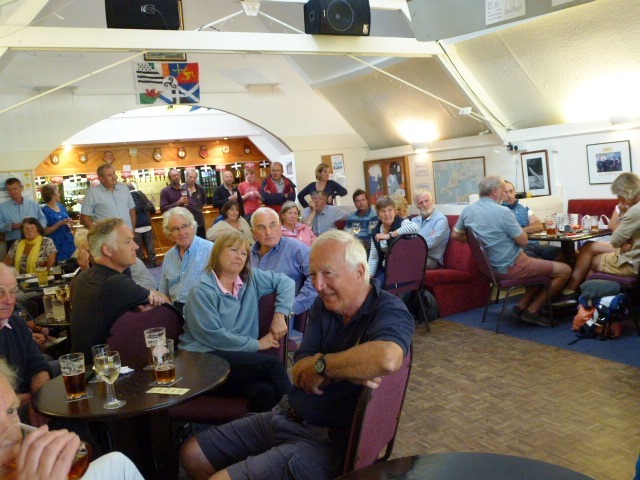 Welcoming drinks were sponsored by C. Toms and Sons Boat builders of Polruan before Vickie Fox from Gallagher Heath presented the trophies indoors .A list of winners can be found on the Trophies and winners page. Gypsy Moth IV team presented a new trophy for the crew/boat to show endeavour won by John Suter all by himself in Serif and a frequent participator in Fowey Classics.May produced an excellent farewell super and the evening was rounded off by entertainment by Press Gang a group of local lads singing nautical, drinking and Cornish songs. Thanks to Gallagher Heath once again as they sponsored the evenings entertainment. A good night to finish an enjoyable week. Most boats headed home the next day before the weather changed again. All had a safe passage and we look forward to welcoming them back next year with all those who missed our 22nd rally.